The first time I tried tiramisu it was in Italy. It was the first day of our Mediterranean cruise and we had the most… interesting tour guide. Her white pants were a little too transparent, her lipstick was thick, and she continually kept saying “Livorno” in a slow, deep accent. Livorno was the city that we were in, which is within the Tuscan county. We took this trip when I was in high school and for some reason one of the things that I vividly remember from this day was sitting in the bus, looking at our tour guide as she stood in the front of bus, in the middle aisle, telling us all about “Livoooorrrnooo” as we drove through an industrial area of the city by the ocean. The other thing I remember was sitting in the basement of a cafe with our fellow tour group members. The windows were high on the wall, through which you could see a sidewalk and people’s feet strolling by. We were served a meat plate of sorts, which I barely touched because hellooooo pickiest-kid-on-the-planet at that time. No one really knew what the meat was, but a lot of people were speculating that it was horse meat. Why they thought that, I have no idea. But good thing that I didn’t eat much…..
Then dessert came out and I had all the heart eyes for it as it was placed in front of me. It was tiramisu! As I took a big bite of the custard/cookie dessert, I quickly found out that it tasted strongly of espresso, which I did NOT like. Also, I was deeply saddened that these cookies were wet - I mean, why weren’t they crunchy like a normal cookie?! I immediately began thinking about how if I can’t eat the Italian food, nor the Italian desserts then I would starve on this trip. I wasn’t at all dramatic *eye roll* - Haha so my first experience with tiramisu did not go well. And yeah, no I definitely did not starve. My daily gelato, entire pizza pies, and nightly chicken fettuccine with its parmesan cheese lattice as decor kept me going and plus some. As my taste buds grew over the years though, I grew to like tiramisu. I can’t wait to go back to Italy to try all of the things that I was too annoyingly picky to enjoy, let alone even try! Alex and I are slowly working on learning Italian (you know, to live up to our Italian last name) before returning to the country. And you can bet that I will be trying some authentic tiramisu!!!! But for now, I will gladly enjoy these DELICIOUS tiramisu sandwich cookies. These cookies have more chocolate flavor than traditional tiramisu. The cookie base is largely made up of melted chocolate, which leads to a brownie like taste and texture to the cookies. Layered in between is the mascarpone filling. 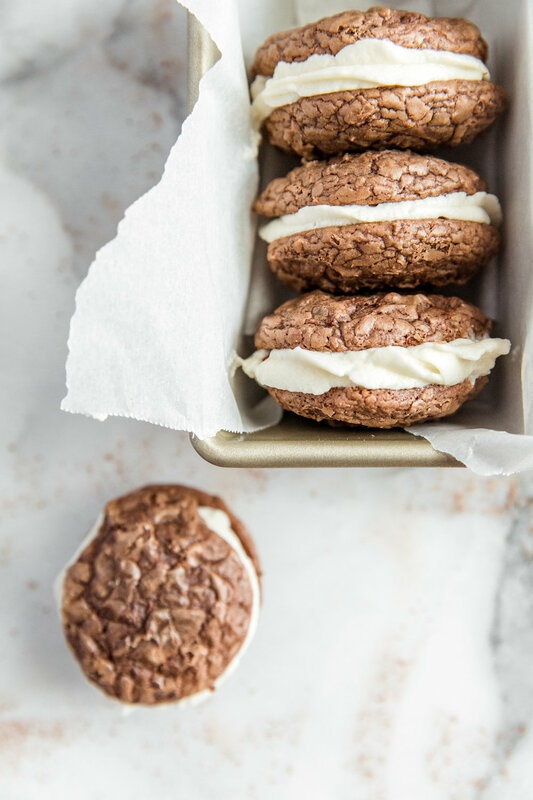 Beaten together with butter, powdered sugar, and a touch of brandy this rich, yet light, mascarpone filling perfectly complements the chocolate-espresso sandwich cookies. For added fanciness, I sprinkled cocoa powder over the mascarpone filling. Keep the cookies in the refrigerator, as this will help harden the filling, making it easier to eat the cookies without the middle squishing out the sides! Enjoy!!!!! Preheat oven to 375F. Line a baking sheet with parchment paper, set aside. Melt the chocolate via a double boiler (*). Set aside to cool. In a small bowl, whisk together the flour, espresso powder, baking powder, and salt. In a mixing bowl fitted with a paddle attachment, beat 3 Tablespoons butter until creamy. Mix in the granulated sugar and 1 teaspoon vanilla. Beat in the eggs, one at a time. Whisk in the melted chocolate, then the flour mixture, and stir until well combined. Set aside the batter for 10 minutes to thicken. Using a 2 teaspoon sized cookie scoop, scoop the batter onto the prelined baking sheet, placing 2 inches apart. Batter will make 28 cookies. Transfer the cookies to a cooling rack to cool completely. Make the mascarpone filling. In a mixing bowl fitted with a paddle attachment cream together the mascarpone and 6 Tablespoons butter. Add the powdered sugar, brandy, and 1/2 teaspoon vanilla. Beat for 3 minutes. Assemble the cookies. Pair the cookies according to similar size. Using a piping bag, pipe the filling onto one cookie in each pair. Sandwich with top cookies. Store the cookies in the refrigerator to harden the filling. How to make a double boiler: Fill a pot with 1 1/2" of water. Bring to a simmer - do not boil. Place a bowl into the pot - the bottom of the bowl should be a couple inches above the water. NO PART of the water should touch any part of the bowl. Place the chocolate in the bowl, and stir occasionally as it melts. Be careful to not get any water into the bowl, as this will cause the chocolate to seize. For best results, occasionally lift the bowl out of the pot, wipe away the condensation under the bowl, then return to the pot. Once the chocolate is melted, remove the bowl from the pot, and again, wipe away any condensation.